The leaflet accompanying this 'Portrait" gives no indication as to when these recordings were made (nor that they are 'in concert'), there are no booklet notes, the recording presents a most truthful and believable perspective but picks up quite a bit of audience rustling and coughing en route, and the piano sounds as though it could have done with a few more minutes with the technician. And yet this is an astonishing recital that is as musically compelling as it is technically astounding in places - rarely have I heard Balakirev's finger-breaking Islamey negotiated with such aplomb and playful indifference to its hair-raising challenges. Ren Zhang won the Artists International Shura Cherkassky Award some years back, and listening to this disc you can certainly hear why. His Schubert late A major Sonata and Chopin A flat major Ballade possess a magical integrity and probing sense of the meaning behind the notes that recalls the 'golden age'. The way Zhang despatches the Friedman-Gartner Viennese Dance is fully worthy of Cherkassky himself, while the Moszkowski op.72 no.11 Etude is thrown off with the kind of effrontery one more readily associates with Horowitz. Wow! Ren Zhang, recipient of Artists International's Shura Cherkassky Award, made his New York debut at Weill Hall on December 14, 1996, just two weeks short of the first anniversary of Cherkassky's death (in London on December 27, 1995). The concert was dedicated to the great pianist's memory and proved, in every way, a worthy tribute. Mr. Zhang, who was born in Shanghai, began his piano studies at age 4 and at the age of twelve entered Shanghai Conservatory as a pupil of Eryao Lin. After winning several prestigious prizes in China, the young pianist came to America, earning his Bachelor and Master of Music degrees from the Manhattan School of Music, working with Solomon Mikowsky. He has also performed in Spain at the Tenerife and Lanzonote Festivals. This concert was a feast for those who rejoice in the piano as a vehicle for warm, songful expression, orchestral richness and diversity of sonority, bracing rhythmic energy, and audacious tonal adventures. From the opening measure of J.S. Bach's Toccata in D Major, BWV 912, Mr. Zhang made the music alive and engaging, lifting it far above musty "scholarship" into soaring realms of communicative vitality. The rhythms pulsed with life; the phases sang continently; structural solidity was ideally balanced with an almost Italianate deftness and humor. The final section proved a scampering delight while avoiding any aura of flippancy. Schumann's Carnaval, Op.9 was played as only the inheritor of a great pianistic heritage could play it. The opening chords of the Preambule rang out with clarion solidity and brilliance; Pierrot engaged the senses with constant, interesting (but never garish!) shifts of balance, color and voicing. Arleguim was pointed, witty and angular. And so it was for the entire sequence: Rapid passagework sounded with dazzling clarity but never - despite its requisite impetuosity - careened out of control. There was a wonderful dance-like lilt to the basic rhythms, and an abundance of goal-directed energy and resourceful characterization. The performance, believe it or not, had one thinking in terms of Gieseking or Rachmaninoff, although Zhang's treatment of detail and notions via tempo relationships was very much his own: To be sure, his was an interpretation very much within the traditions of the great virtuosos trained during the late nineteenth and early twentieth centuries, but that "Tradition," lest it be forgotten, allowed - nay, cultivated - freedom of thought and expression. The second half of the program was entitled "The Art of the Transcription." Mr. Zhang led off with dewy-fresh, tonally bejeweled accounts of two of Chopin's Polish Songs ("Te Maiden's Wish" and "My Joys") in Liszt's ornate and resourceful recastings for solo piano. The brilliance, style, and ease of the vocal line and lightness of filigree were worthy of any Golden Age pianistic giant one would think of - and they were exhibited with a selfless simplicity that was devoid of any suggestion of self-importance. Mr. Zhang's evident purity proved even more remarkable as implied to Leopold Godowsky's cerebral ornateness and contrived convolution as inflicted upon Chopin's Etudes. With his sleight-of-hand, this miraculously brilliant technician was able to glide through Godowsky's Chromatic slitherings without succumbling to their lethal, nauseatingly oversweet fumes; and he was able to articulate the dense textures with limpid, transparent radiance. As Zhang elevated them, Godowsky's reworkings of Chopin's E minor study, op.25, No.5; his D flat recasting, for left hand alone, of Chopin's Tristesse E major Etude, op.10 No.3 came closer to approximating the spirit of the originals than I, for one, would have ever imagined. 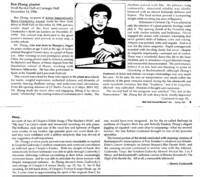 As for the so-called Badinage (a synthesis of Chopin's Black Key and Butterfly Etudes), Zhang's elegant juggling act equaled - and came close to surpassing - what my revered teacher, the late Robert Goldsand brought to one of his pianistic specialties. The formal portion of the recital concluded with stunning versions of Rachmaninoff's transcriptions of Fritz Kreisler's Liebesfreud and Schultz-Evler's Concert Arabesques on Johann Strauss's Blue Danube Waltz, and the ensuing encores continued in similar vein with the Albeniz-Godowsky Tango, the Schubert-Godowsky Moment Musical No.3 in F Minor, and Rachmaninoff's airbonne version of Rimsky-Korsakoff's The Flight of the Bumble Bee. All in all, a memorable afternoon! As with his earlier release, Ren Zhang limits himself to mostly shorter pieces. Even Schubert's Sonata in A (the earlier one), shorn of repeats, takes only around 15 minutes to play. This brevity extends to the album notes as well - there are none. The record, made in recital, has generally good sound, with a liberal amount of audience noise and applause. Were I present at these performances I certainly would have joined in the enthusiasm. Ren Zhang is a very musical pianist, with a more than respectable technique. He makes little attempt to wow the listener but prefers to understate, which he does in a most expressive manner. Chopin's Ballade 3 is comforting to listen to and eschews big gestures. Three of the composer's etudes, including a posthumous one, are feather-light in execution, as is Sinding's 'Rustle of Spring' (quaintly translated as Rustling of the Spring). Balakirev's Islamey is a powerhouse that requires not only prodigious technical feats, but a temperament willing to spill over the top sometimes. It is the only work in this recital that misses the mark, as Ren Zhang seems unwilling to give it the extra heft needed. Attempts at subtlety rob the music of its forward momentum. This is a small defect in light of the many treasures to be found here. There pieces by Poulenc, Friedman, Mompou, and Moszkowski lend special interest to an impressive recital, and one should never forget the beauty of execution in the Schubert sonata. With that said, some of our readers may be put off by this pianists rolling of chords and often placing his left hand down just before his right. It's a throwback to the Golden Age of pianism, where it was done often; but few of today's artists dare to do it. While it works for Ren Zhang - and for me - it may not work for you.